I know I should update, and so I am. It's not that I don't have anything to say, it's just that I've got too much to do to say anything. That, and there's not much I have to say that doesn't require a lot of brain power, something I'm low on right now. So I will tell you that I was up till 2 a.m. on Saturday night/Sunday morning updating my MySpace (don't you feel unloved, since I updated MySpace before blogger? You should. Actually, you shouldn't. MySpace requires little to no brain cell usage to update.) I spent most of my time uploading pictures--well, shrinking the pictures so I COULD upload them--and looking for a song to add to my profile. I'm still not overly satisfied, but there you go. And the reason I was up was because caffeine does strange things to my brain, preventing it from sleeping, and yet not helping out too much with thinking, either. Anyway, the point was (and my point is really not worth all of this, but you wanted me to update, so it's your fault) when I went into the kitchen to get something to eat--because one gets hungry at 1 a.m.--Molly was sitting in the kitchen sink. I have no idea why--it's not like she was chasing anything in there. Nope, she was just sitting. I shooed her out before taking a picture, and for that I apologize. I halfway thought about putting her back in to take a picture, but then what would she learn? 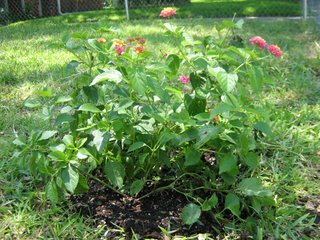 I planted a lantana in my front yard (should lantana be capitalized? I think it should, but I'm not looking it up right now). I think it's doing well. 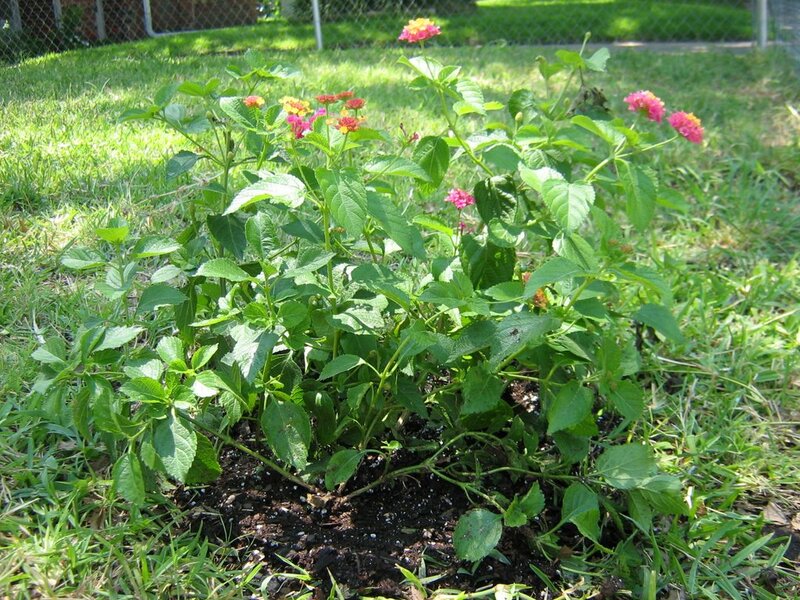 It's had several new blooms since I planted it, although that was on Saturday, so maybe it's too soon to tell. I think it's purdy. Hey, I just noticed the new Myspace photo when I was browsing (read wasting my work day). Thanks for the update! I'm going to call you tonight. At least that is the plan. That was also the plan on Friday. But now I have it in print, so I will feel really bad if I don't. Thanks for the update, and I love lantana. 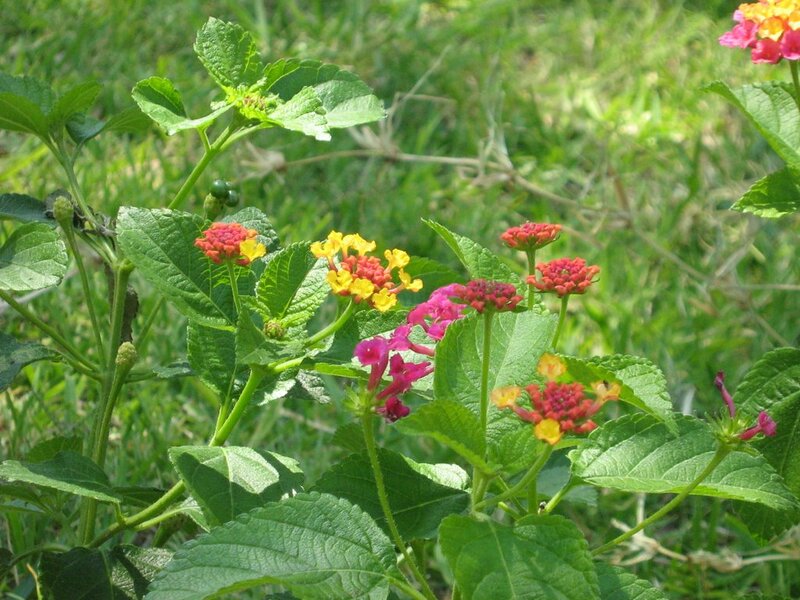 Or is it Lantana? Hmm, I actually think not, since that's a Latin name, right? OK, you're the one who likes to look these things up, so I'll leave that to you. By the way, I'm in town for a wedding this weekend, and hopefully stopping by the Srirams for a little bit at some point. I'd love to get to say hi to you guys too, but it probably couldn't be for long what with all the wedding stuff and hosting that I'll be doing. Is there a chance I could stop by for a few? 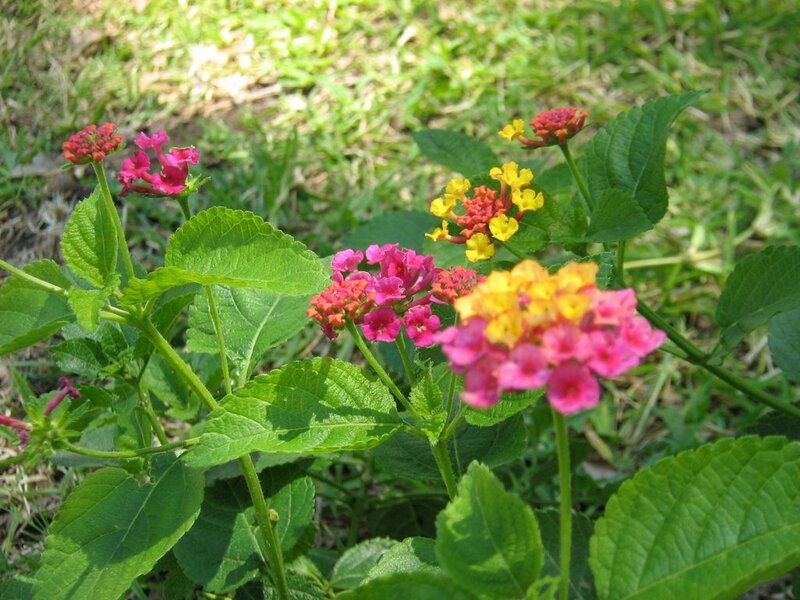 Your lantana is loverly! As usual, you made me chuckle. Chuckle. Chuckle. Weird word. Chuckle. It's certainly not, um, what's that word for words that sound like the sound you're making? Chuckle is not that. When I chuckle, it doesn't sound like chuckle. I guess I should have said you made me heh, heh. I think you know exactly who wrote this. Onomotopoeia...let me check the spelling of that...OOOHHHH, so close. It's onomAtopoeia. Are you my mother? If not, I have no idea who you are. Onomatopoeia! I thought of it as I was driving home. Actually I thought of it while I was writing my response, but dismissed it without thinking about it. Then when I thought about it, I realized "that's it!". But then I realized I couldn't have spelled it anyway. I'm disappointed you weren't absolutely positive, but at least I was the first (and only) person that came to your mind!